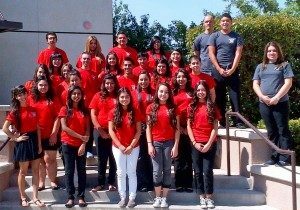 The Mariposa Community Health Center’s Summer Youth Institute trains teens and empowers them to educate others about positive health behaviors. Twenty-four of these well-trained teens graduated July 26th from SYI in a festive celebration held at Diamond House in Nogales. In addition, students become certified in HIV/AIDS Education, Tobacco Basic Skills, and First Aid/CPR. They join MCHC professionals for a week of job shadowing in adult and pediatric medicine, nursing, laboratory and radiology, dentistry and new to SYI this year, behavioral health. Teens gain on-the-job experience and are paid a stipend to participate. They gain self-confidence, public speaking skills and new friends. After certification Teen Health Facilitators become a great resource for our community. They are able to gain access to other teens who may be at risk of engaging in unhealthy behaviors. Their skills are used throughout the year to educate the community with activities such as the Great American Smokeout, an annual event to help smokers who want to quit, and Kick Butts Day, a world-wide event where youth STAND OUT… SPEAK UP… and SEIZE CONTROL AGAINST BIG TOBACCO. They help with health fairs and MCHC’s annual Haunted House, which educates the community about such things as drinking and driving, HIV/AIDS, teen dating violence, and teen pregnancy. Many SYI teens go on to seek careers in public health areas they encountered in SYI. Over 200 teens in our community have completed the program since its inception over a decade ago. The program is managed by MCHC’s Platicamos Salud, recently renamed the department of Health and Wellness. For more information about the Summer Youth Institute, contact Alicia Villa at avilla@mariposachc.net.